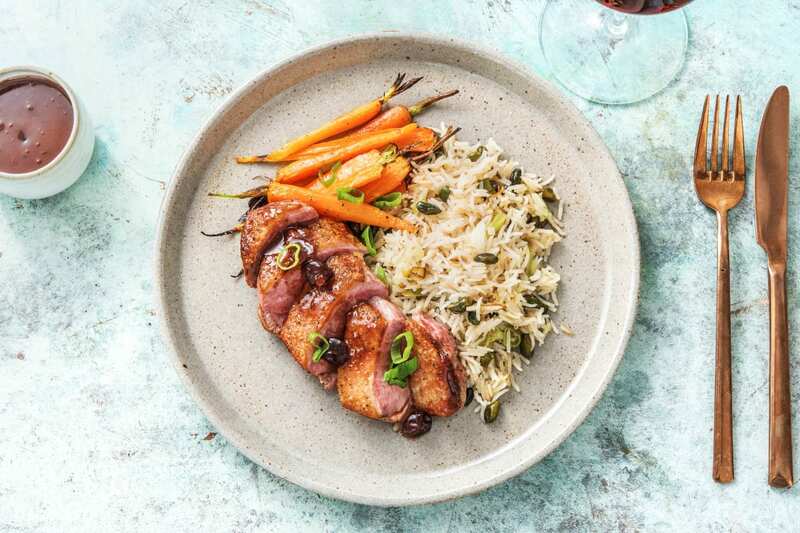 Rich, juicy duck pairs beautifully with a sweet, fruit-based sauce—it’s a combo that’s about as classic as can be. Our chefs decided to take things a step further by adding a bit of ancho chili powder into the mix, which creates this smoky, sultry mystique. 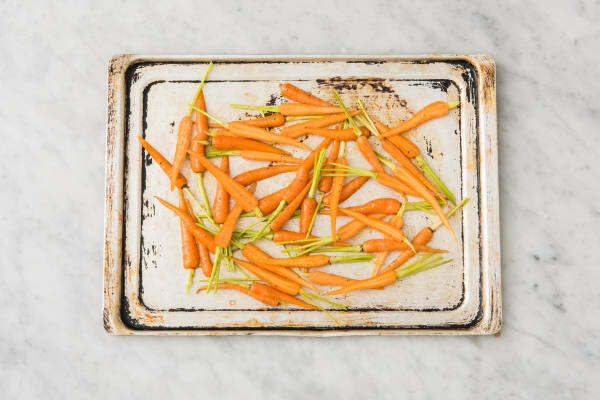 The excitement only continues with the sides: pistachio-studded rice and tender roasted carrots. This is the sort of dish we’d want to make when we’re feeling a little bit fancy. Wash and dry all produce. Preheat oven to 425 degrees. Pat duck dry with a paper towel and season with salt and pepper. 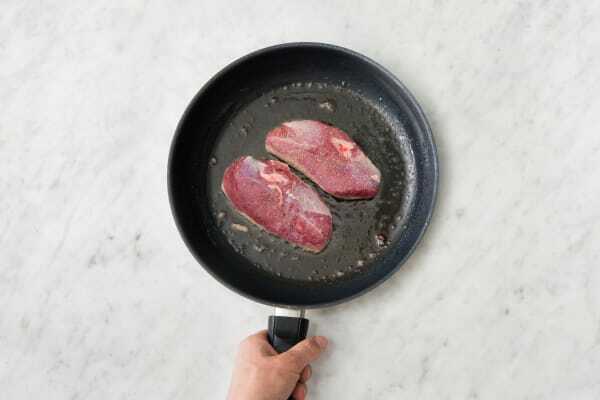 Place in a medium pan skin-side down (use nonstick if you have it). Cook over medium heat until skin crisps, 13-15 minutes, pouring out and reserving fat as it’s released (don’t flip it just yet). Meanwhile, trim carrots, then halve lengthwise. 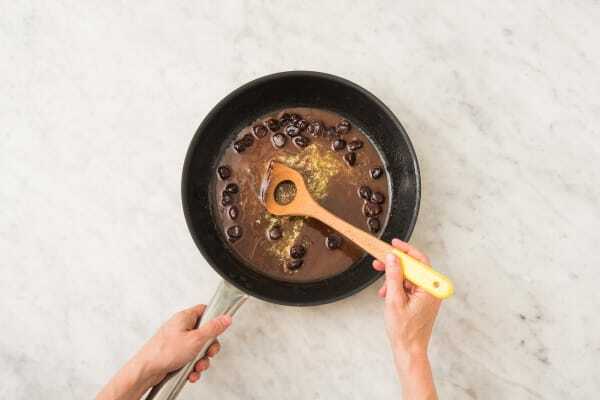 Place on a baking sheet and toss with a large drizzle of olive oil. Season with salt and pepper. Roast in oven under tender and slightly blackened at edges, 20-25 minutes. Meanwhile, trim and thinly slice scallions, separating greens and whites. 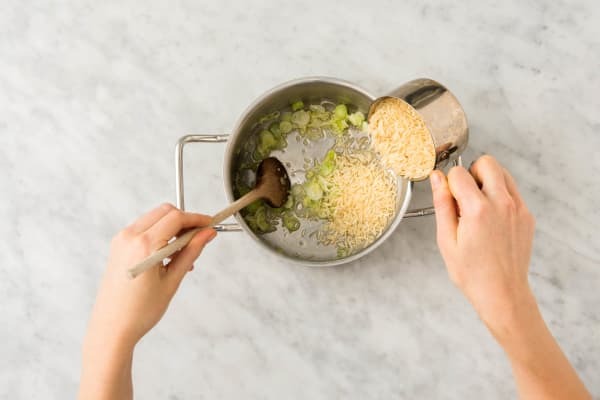 Melt 1 TBSP butter in a small pot over medium-high heat. Add scallion whites and cook, tossing occasionally, until just softened, about 1 minute. Stir in rice and ¾ cups water. Bring to a boil, then reduce heat to low. Cover and let simmer until tender, 9-11 minutes. Remove from heat and let stand 5 minutes, covered. In a small bowl, stir together jam, demi-glace, chili powder, ¼ cup water. Once skin is crisp, flip over duck in pan. Pour in jam mixture and add dried cherries. Let simmer until sauce is thick and duck reaches desired doneness, 2-5 minutes. 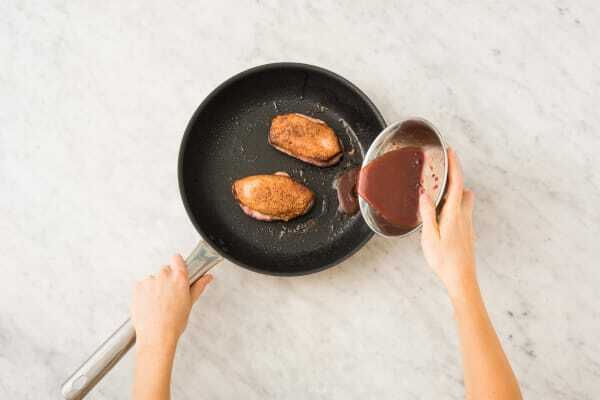 Transfer duck to plates for serving, leaving sauce in pan. TIP: If sauce if stiff, add a tablespoon or two of water. Reduce heat under pan to low and stir 1 TBSP butter into sauce. Once melted, season with salt and pepper and remove pan from heat and set aside. Fluff rice with a fork, then stir in pistachios. Season with salt and pepper. 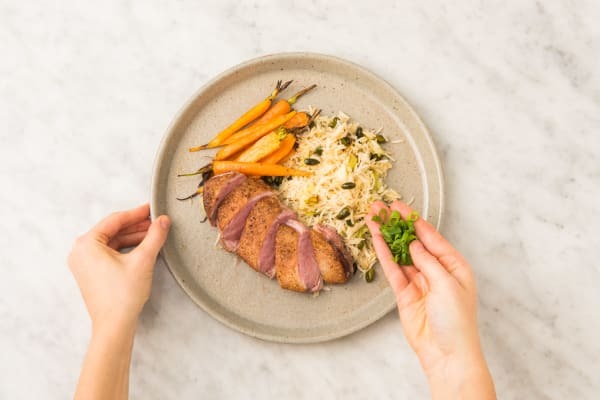 Divide rice between plates with duck, then pour sauce over duck. Add carrots to the side. Garnish with scallion greens and serve.